Sorry for more topics about features. Can we please request a RMB feature for Brushes? It would be good for productivity if RMB opened a quick access to the brush width , opacity, flow and hardness values? Or a Keyboard shortcut like CTRL + ALT + LMB to change the size and hardness of the brushes in real time? Similar to what Photoshop has. Can you give screenshots how that looks like in Photoshop? In Photoshop Elements you just can change the brush type with RMB which is IMHO of little use. When you right mouse button this pops up. Of course you should be in brush mode. I'd much rather prefer how Easy Paint does it. It's holding down CTRL + ALT and LMB drag.. but I don't think this is an easy feature to implement for the Affinity team. Yeah, Easy Paint seems to have a nice solution. There is much need to scroll wheel and with a slider you feel to be more in control. 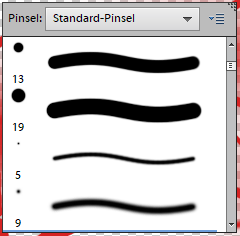 On Windows if you press Alt and both mouse buttons at once, dragging up/down changes brush hardness and dragging right/left changes brush size. An on-screen display shows the size of both in pixels while you make the adjustment. The brush properties change via hotkey+gesture is nice for sure but having a brush picker right under your mouse (ideally combined with a color picker) would be preferable IMO. Photoshop (full version) should serve as an inspiration for how to do it. Not on my Windows laptop, it isn’t! It’s physically impossible for me to press both the RMB and the LMB at the same time.